When Jimmy Graham signed a three-year deal worth $30 million with Green Bay back in March, he was expected to be a big weapon for Aaron Rodgers to throw to — especially in the red zone. Eleven games into his stint in Green Bay, that has not been the case. 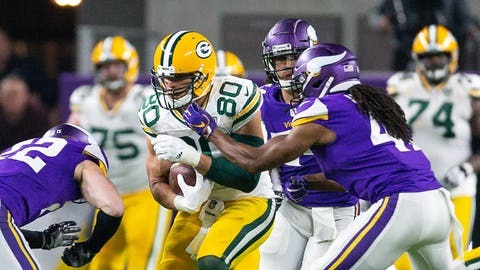 Playing through a broken thumb that kept him off the field in obvious blocking situations, Graham was limited to 22 of the Packers’ 53 offensive snaps (42 percent) on Sunday in Minnesota. Against Seattle in Week 11, Graham played in 21 snaps (43 percent) before leaving with the injury. He had been playing in at least 2/3 of Green Bay’s offensive snaps in each of the Packers’ first nine games. Fellow tight ends Marcedes Lewis (23) and Lance Kendricks (22) saw a similar amount of playing time against the Vikings despite Graham’s hefty price tag. For Lewis, it his most offensive snaps of the season. His previous high was 22 (31 percent) against San Francisco in Green Bay’s sixth game. Graham was targeted just four times and caught two passes for 34 yards. The 32-year-old has tallied more than 34 receiving yards just once in the past five weeks. And he hasn’t done much in the red zone, either. Aaron Rodgers has targeted wide receiver Davante Adams a league-high 23 times inside the 20-yard line, while Graham has seen just eight — or 14.5 percent – of the red-zone targets. — For just the second time this season, Adams played in 100 percent of the offensive snaps. — Wide receiver Marquez Valdes-Scantling was on the field for 44 plays (83 percent) but was targeted just twice, with one catch for three yards. — Jason Spriggs replaced an injured David Bakhtiari at left tackle twice due to injury and totaled 10 snaps in the loss. — Defensive tackle Kenny Clark played in a season-high 66 snaps (94 percent). He had four tackles and a sack. — Due in part to injuries, Ibraheim Campbell, who was claimed off waivers three weeks ago, played in 53 (76 percent) defensive snaps.